The RoboSimian was developed at JPL and competed in the DARPA Robotics Challenge to showcase technologies relating to disaster response, robotics and unmanned systems. The Spitzer Space Telescope captures a view of the Andromeda Galaxy. Spitzer is managed by JPL in collaboration with Caltech, and JPL partners with several universities on a variety of projects. JPL has many CubeSat projects, such as one developed by the RACE team, pictured here. Early Career Hires play important roles at JPL. Like students and postdocs, they can bring fresh ideas to many areas of research. Researchers with new and exciting ideas are key to JPL's success, which is why JPL invests heavily in research and development activities. These investments often make use of strategic university and industry partners who are key to achieving advances in science and technology and ensuring mission success. Funding is available for those tasks that have strong partnerships and show the promise of making advances on the cutting edge of research. 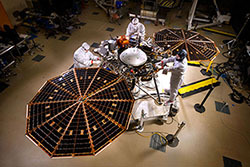 JPL is committed to working with industry to transfer technologies and develop commercial products and services, which employ NASA developed technologies, but address Non-NASA needs. Small businesses can be valuable partners in JPL's efforts to advance technologies in new and innovative ways. Information on different opportunties can be found below.